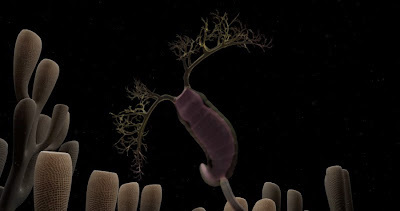 Life Before the Dinosaurs: Herpetogaster. 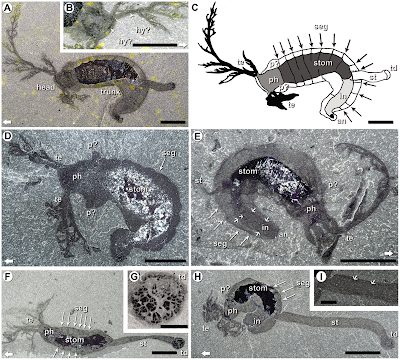 Herpetogaster is a genus of Burgess Shale animal that cannot be classified. It doesn't look like any known life form alive on earth today. Instead, it looks like an alien life form. It could possibly be related to eldonids like Eldonia. Herpetogaster had an enormous stomach, like the sack-like Mackenzia, and a long, flexible stalk called as stolon with a disc at the bottom. This disc may have either been used for creeping slowly across hard surfaces like the sea bed, sponges, and rocks, or it could have been used for anchoring Herpetogaster to hard surfaces. Herpetogaster has been described from 101 specimens. It is extremely rare in the Walcott Quarry--only six specimens come from there. But the rest come from the Raymond Quarry. Fossils of Herpetogaster have been found near those of the sponge Vauxia, which suggest that Herpetogaster may have attached itself to sponges. My hypothesis is that it may have chosen Vauxia because of Vauxia's bush-like form, which would protect it from predators by keeping it tangled up inside the branches. Herpetogaster can be loosely translated to "creeping stomach," referring to its enormous stomach and its possible ability to creep. Herpetogaster was described by Simon Conway Morris, Jean-Bernard Caron, and Degan Shu in 2010. Thank you! It sometimes does take me a long time to find information about these organisms. Because most people have never heard of them, there's not a lot of information about them on the internet or in books. I think these organisms are amazing! 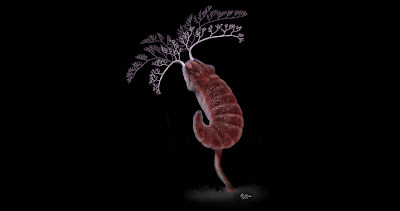 It could be perhaps a distant relative of Pterobranchs ( the body seems to be not metamerized inside ).